If you are wondering if it is even possible to homeschool while you are working, stay tuned. I’m going to share the secret to juggling work and homeschool! Mommas ask me almost every day… “Is it possible to work and homeschool at the same time?” The stories are all different, but their heart cry is the same. They want the best for their family. Some moms need to bring in a little extra money to help pay off debt or pay for extracurricular activities. Some mommas are going it alone, and their families are dependent on Mom’s job. Some moms are desperate to get their kids out of a undesirable school environment, but have no idea how to do that when they have to work. Whatever the story, I’m here to encourage you. It absolutely is possible to homeschool and provide for your family at the same time. It’s certainly a challenge. But definitely doable. I have worked a full-time 8-5 job and successfully homeschooled my three kids. I am currently juggling a couple of fledgling businesses and homeschooling successfully. I am living proof that it can be done. But your homeschool probably won’t look the same as it did before you started working. There will have to be some give and take… some compromise. There’s a little secret about doing it all…. you can’t do it all. Although we sometimes like to think so, God didn’t make us to be Superwoman. As amazing and talented as mommas are, we can’t do everything at the same time. Actually, we might be able to for a short time, but eventually we will wear down or burn out. So here are a couple of tips to help you be able to homeschool and work too. For me, this one is number one. Make sure you are doing what God wants you to do. I don’t believe that every family HAS to homeschool. It’s the path that God has chosen for my family, but make sure that’s what God wants for you before you venture out too far. You are not a failure if you send your kids to school. But if you are called to homeschool and work, God will take care of the details. It seems like modern Americans like to be independent, and prove that we can pull ourselves up by our own bootstraps. But I believe that God wants us to bear one another’s burdens. It isn’t a mark against you if you need help. In fact, maybe someone out there is looking for a way to help, and they don’t know how. You won’t know until you reach out to someone around you. Maybe it’s a fellow homeschool mom who is able to add your kids to her crew for a day a week. Or maybe it’s a family member who volunteers to teach your highschooler Algebra or Calculus. Or maybe Dad comes home in the evening and teaches science or history, or checks math homework. Whatever it is, realize that you don’t have to do this thing by yourself. When deciding how to tackle the jobs of homeschooling and working too, you have decide what is most important to you. Do you really have to work full-time? Is it possible to do any of your work from home? Maybe you don’t need to make quite as much as you used to. Or maybe you can telecommute for a couple of days a week. 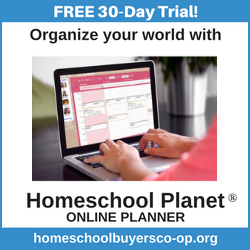 Or you can change the way your homeschool works. How much interaction do the children need from you as their teacher? Maybe they can work independently, and you only need to keep them accountable. Maybe you can find online classes to help them be more independent. For younger kids, maybe they really don’t need as much instruction as you might think, and most of their work can be finished on days that you are off work. For me, it’s been a little of all of these things. I feel very strongly that God has called me to homeschool my kids. And because I’m a single mom, I absolutely have to work to be able to pay the bills. When I worked full-time outside the home, I had to have a lot of help. God has always provided a way for my kids to be able to stay with someone I trusted while I was working outside the home. I would plan their schoolwork, and she would watch them for the day. Because she also homeschooled, my kids just went with the flow of their homeschool day. I would help in the evening and check over everything on the weekends. Truly, it was the best thing for my kids since I couldn’t be with them. Now that I am working from home, blogging and bookkeeping, I can be present in the home even while I am working. If there is an emergency or problem, they can come and get me, but otherwise, I need to be able to work for a certain number of hours during the day. Usually that means I’m at my desk in the living room, and they are scattered throughout the house wherever they want to be. Superman almost always hangs out with me in the living room, listening to an audio book and building something with Legos. I also do some of my work late at night after I have gotten the kiddos in bed. We are beginning to get a good rhythm down now that we are half-way through the school year! Also, this year we have utilized more online classes. The classes we are using this year are through Virtual Homeschool Group, which are donation and volunteer-based. I taught a Government class that I was going to teach my daughter anyway, and she has been able to take several other classes for free. For me, it has been a wonderful relief to have her be taught by some other wonderful homeschool moms! And she has loved every class she has taken. VHSG has been an amazing blessing to us this year. I’m also looking at using Schoolhouseteachers.com next year, but the format of these classes are much different. If you have any info or have used it, I would love to hear more about it. I will be signing up for the $1 month-long trial period over the summer to see how we like it. It seems to have lots of different classes to please almost any student. And I just found out that they just added access to a massive World Book library of info. It might be worth the subscription price just for that! We’ve never used them, but I have heard alot of good things about the classes at CurrClick, too! I’m really looking into having Beezus take American Sign Language on CurrClick in the fall. I have gotten lots of amazing printable curriculum at CurrClick, so I have no doubt the classes will be great as well. So how do you juggle homeschooling and work? I’d love to hear about it! Comment below or join us for a conversation on my Facebook page!